The Cotswolds consists of a group of small villages where the best wool could be find during medieval times, and the area prospered. However, the advent of cotton reduced the market for wool and the villages fell unto hard times. These photos are from Nov 2010. While we stayed in Moreton-in-Marsh (which works well as a transportation hub), we actually weren't able to spend a lot of time wandering around. We did get to see the Tuesday Market and have dinner in a local pub. Like other villages, there's a main street (normally called High Street) where the commerce happened. It's not exactly clear what the origins are of the name, but the consensus seems to be that Moreton means a settlement founded on moor land. The town was originally named Henmarsh, which means a settlement upon which birds nest. The "Hen" probably became "in" as the name was passed among people, becoming Moreton-in-Marsh. 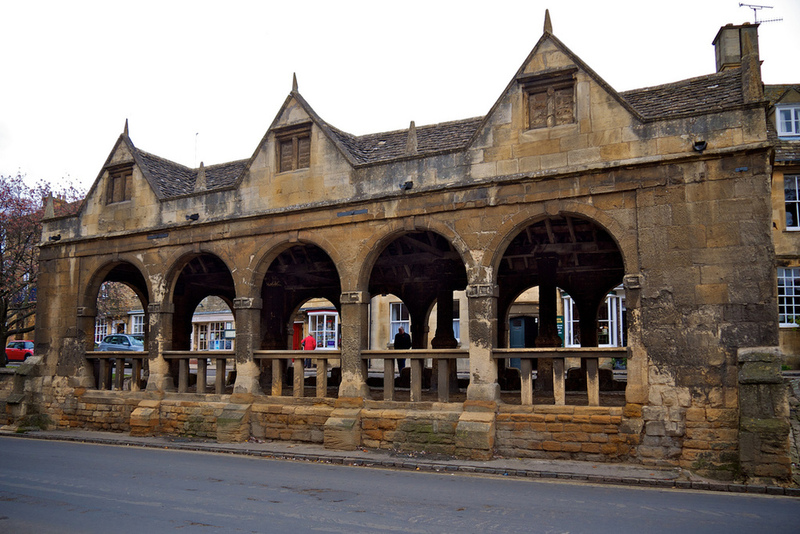 Chipping Campden used to be the home of the riches wool merchants in the Cotswolds. It's a very active village, and has lots of historic buildings to wander around. High Street, instead of being straight, gently arcs to follow the River Cam, and Lower High Street arcs away from High Street at a slightly higher elevation. The town got its start in 1185 when the Lord of the Manor Hugh de Gondeville was granted a market charter by King Henry II. Blenheim Palace is the current home of the 11th Duke of Marlborough, John George Vanderbilt Spencer-Churchill. You'll notice several surnames; Churchill from John Churchill, the first Duke of Marlborough, Spencer (as in Princess Diana's family) from the second Duchess (John didn't have a son to be heir, so the eldest daughter was allowed to become Duchess), and Vanderbilt, from Consuelo Vanderbilt who married the 9th Duke. In addition to the ability to view several public rooms of the palace (including a large collection of memorabilia from Winston Churchill), you can also roam around much of the palace grounds.